Are you ready to test yourself in Three of the Hardest, Most Grueling Double Centuries on this planet? Are you ready for Two Hundred Miles with tons of Steep Climbing? Then a couple of weeks later, Two Hundred More Miles with more Steep Climbing? Then if you have any strength left, are you ready to tackle the Terrible Two with Two Hundred More Miles, 16,000 Feet of Climbing, White Knuckler Descents, and Temperatures over 100 Degrees? If so, then we've got a deal for you!! This is how the Stage Race works: Riders have to complete the Three Most Difficult Doubles in the California Triple Crown: Devil Mountain, Central Coast, and the Terrible Two. The Total Elapsed Time from each of these grueling Doubles is then added together and the rider with the fastest overall time for all Three Doubles wins the Stage Race. WARNING: These rides are NOT for the inexperienced or occasional rider. On the Schedule Page, you will notice that the Difficulty Rating by the "California Triple Crown" for each of these rides is: Extremely High. Do not make any of these rides your first Double Century -- because if you do, you may not want to do another one!! However, if you are in the best shape of your life and you are looking for the ultimate one day tests of your physical and mental fitness, then these rides are for you!! How hard are these rides? Brutally hard. Hard beyond description!! In 1999, the Devil Mountain Double was a true challenge of over 18,000 Feet of Climbing. Only 74 Riders Started this brutally hard ride and only 59 Finished ... 15 Riders Did Not Finish this First Stage of the Stage Race!! 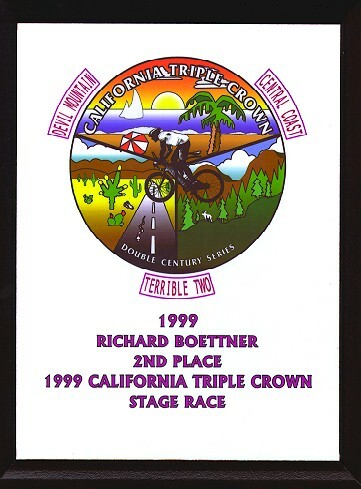 In 1999, the Central Coast Double was a challenge as always with 210 Miles and over 13,200 Feet of Climbing!! Of the 131 Riders that Registered, 115 Started, 100 Finished and 15 Did Not Finish this Second Stage of the Stage Race. The Terrible Two has a reputation of being the most difficult Double Century around. Although the route has varied in small ways over the years, its defining features have always been its four big climbs (and the steep, twisting descents that follow): Trinity Grade, the Geysers, Skaggs Springs, and Fort Ross. Numerous smaller but pesky hills add to the overall challenge. Trinity, the Geysers, and Fort Ross are all double-summit climbs, while Skaggs Springs is a long series of climbs and descents. Few gradients on the course exceed 15%, but many climbs stay in the 8-12% range for long distances. The Terrible Two Web Site has an excellent Elevation Chart which graphically shows just how brutal this course with over 16,000 Feet of Climbing really is!! In 1999, the Terrible Two was hot and brutal with 200 Miles and over 16,000 Feet of Climbing!! Of approximately 225 Riders that Registered, 191 Started, 164 Finished and 27 Did Not Finish this Third Stage of the Stage Race. The 1999 California Triple Crown Stage Race yielded total of over 600 Grueling Miles with over 47,200 Feet of Climbing!! Results are in from the Devil Mountain Double held 4/17/99, the Central Coast Double held 5/08/99, and the Terrible Two held 6/26/99. The report below shows the "Leader Board" of those riders who completed all three Stages of the Stage Race, ranked by Total Overall Time. The competition was indeed fierce this year. 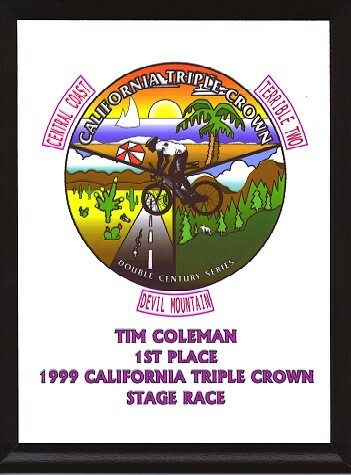 In his first year at competing in the California Triple Crown Stage Race, Tim Coleman from Fresno won the Stage Race. 37 Minutes back, Rich Boettner came in Second Place thanks to a most impressive time at the Devil Mountain Double where he set a new course record!! Only 1 Minute behind was Ray Plumhoff in 3rd Place. Ray was the Winner of the Stage Race last year and nearly pulled into 2nd Place by an incredible time on the Terrible Two where he came in First Place!! The BikeCal.com Web Site has some great photos of the top Finishers here. Click on the small photo to see an enlarged version of the photo. The Top 3 Finishers in the Stage Race, Tim, Rich, and Ray, have received a Custom California Triple Crown Plaque, at no charge. Worthy of Honorable Mention was Daryn Dodge in 4th Place. Daryn was the First Place Winner of the 1996 Stage Race. Ben Miller in 5th Place was the 3rd Place Finisher in the 1996 Stage Race. Also, Jim Frink in 6th Place was the First Place Winner of the 1997 Stage Race. Everyone who completed the 1999 Stage Race is to be commended. Our hat is off to each of the 29 Finishers ... just to complete these three Extremely Difficult Rides is a major accomplishment!! What's wrong with the above picture? There aren't any Women on the list!! Lydia Foster had completed the Devil Mountain Double and the Central Coast Double and was well on the way to completing the Stage Race. Sadly, she crashed in the last few miles of the Heartbreak Double and was unable to ride the Terrible Two. In order to help motivate the Women to tackle the Stage Race next year, the top 3 Women will also receive plaques!! You don't have to do anything special to sign up for the Stage Race: In 2000, all you have to do is to sign up for and ride your heart out on the Devil Mountain Double, Central Coast Double, and the Terrible Two!! Of course, that's much easier said than done!! Also, if you ride any Stage on a tandem, you must ride all three Stages on a tandem with the same partner. The California Triple Crown lays down this challenge: be among the select few who are able to finish the Stage Race!! 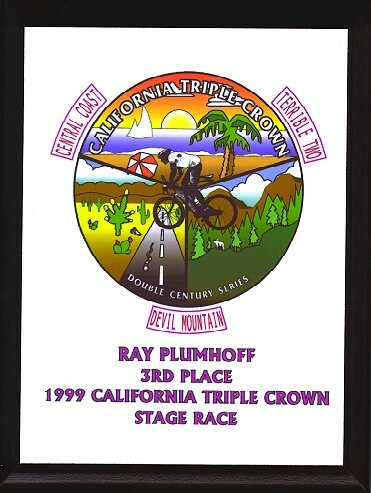 Congratulations to all Finishers in the 1999 California Triple Crown Stage Race! !